The Great Work was completed on a rainy Thursday afternoon. 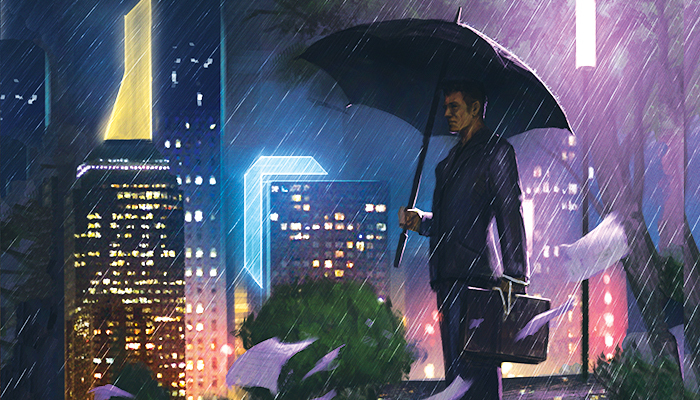 As Android: Netrunner comes to a close, the game's Organized Play is also coming to an end—but not before players have one final chance to gather and celebrate the game's thrilling, high-stakes cyberstruggles! Download the Android: Magnum Opus event schedule (pdf, 166 KB). From September 7th – 9th, the Fantasy Flight Games Center will play host to Android: Magnum Opus and the final Android: Netrunner World Championships. Corps. Runners. Games. Glory. You can expect them all. Even so, this event is far more than one final tournament. This is a celebration of the Android: Netrunner community and all things Android. Android: Magnum Opus will provide all attendees with an immersive experience, starting with the World Championships and rolling those into an overarching experience in the Android universe. A very limited number of seats will become available during our first-come / first-served second wave registration for Android: Magnum Opus, which opens August 28th at 12:00 PM CDT (UTC -0500), and attendees will enjoy all the thrills of the 2018 Android: Netrunner World Championships, as well as a unique one-versus-many Android: Netrunner experience, Genesys roleplaying sessions set in the worlds of Android, and a weekend-long exploration of the Android setting that will thrust you neck-deep into the midst of an orgcrime turf war. For years, the Android: Netrunner community has expressed its appreciation for the game's near-dystopian setting, and now you'll have a chance to change the setting. As rival criminal organizations renew their struggles for Base de Cayambe and the ability to smuggle goods up and down the Beanstalk, your actions over the course of Android: Magnum Opus will decide which orgcrime outfit rises to prominence. Who knows—it might even be your criminal organization that wins! Undoubtedly, the highlight of Android: Magnum Opus will be the 2018 Android: Netrunner World Championships. The final World Championships for this storied LCG® of corps, runners, and high-stakes cybercrime, this tournament will bring the community together one more time and crown the game's final World Champion. The 2018 Android: Netrunner World Championships will be the last official Organized Play event for Android: Netrunner, and we'll be pulling out all the stops with our prize support. In addition to the commemorative apparel you'll receive with your event registration, you'll earn a copy of the new NAPD Corp ID we'll be featuring in our one-versus-many matches, and have the chance to vie for exciting bounty prizes every round. The action will begin on Friday, September 7th, with the first group of players competing in Day 1A, continue on Saturday with then next group in Day 1B, and then all players with 28 tournament points will advance to Day 2 Swiss rounds on Sunday, followed by a cut to the Top 16. The Top 16 will continue with double-elimination rounds until the world's best corp and runner face each other—each aiming to see the game out on a high note as its final World Champion. Yet, even as the 2018 World Champion helps bring the game to its grand conclusion, he or she will find a new, enduring role within the Android setting. Working with the developers of the Genesys roleplaying game, the 2018 Android: Netrunner World Champion will help to inspire and craft a character within the Android setting—potentially even envisioning his or her avatar as a crime boss who helped to win the weekend's turf wars. More than this, he or she will have a chance to play that character during a special Genesys roleplaying adventure, set in the Android universe, at PAX Unplugged, the weekend of November 30th to December 2nd. Travel and accommodations will be provided for the winner to attend. During the construction of the Beanstalk, New Angeles was a boom town, a beacon of near-limitless possibilities that drew ambitious men and women of all stripes to the slopes of Volcán Cayambe. The lure of easy money and unclaimed territory drew the attention of numerous powerful criminal organizations from around the world, and they flocked to the new city to carve out what they could. 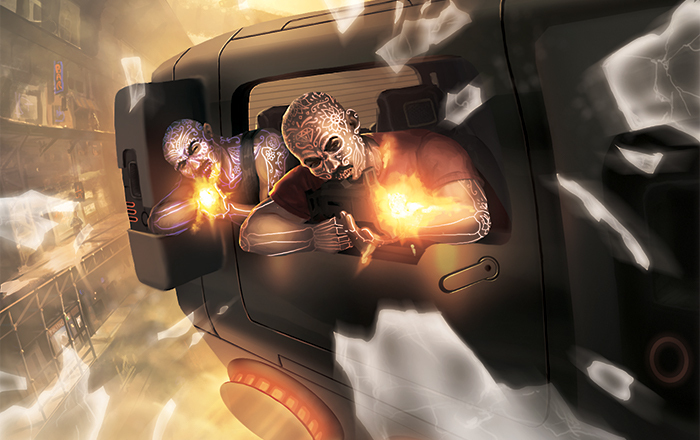 –The Worlds of Andorid, "Organized Crime"
The Android universe existed before Android: Netrunner, and it will continue after the game has come to a close. Nonetheless, it is impossible to deny the impact that Android: Netrunner has had upon the Android universe and its fans. For most fans of Android: Netrunner, the game was their first interaction with the not-too-distant future of the Android setting, its Big Four corporations, and its diverse cast of hackers, sysops, clones, bioroids, street bangers, mid-level executives, enforcers, and crime bosses. And for many fans, the game's setting proved to be one of its most attractive selling points. Accompanied by some of the industry's greatest art, the Android universe, its corps, and its characters reinforced the timeliness and intellectual validity of the game's themes. Players who lacked an analog in other game worlds found themselves mirrored in the setting's diversity. We frequently saw players express their desire to explore the setting in other ways—especially via roleplaying. At Android: Magnum Opus, you will have the chance not only to enjoy a Genesys adventure in the Android setting, but to take part in a larger, weekend-long roleplaying event that will allow you to both explore—and give shape to—the Android setting. There's a turf war underway between the orgcrime outfits in New Angeles. When you register for Android: Magnum Opus, you'll find yourself connected to one of the city's orgcrime outfits—either Los Scorpiones or 14K. Then, throughout the weekend, you'll have the chance to help your organization become the city's preeminent criminal power. You'll control the streets that host the Beanstalk, and that means controlling the Beanstalk—and everything that smuggles up or down its incredibly lucrative channels. Each of your victories in the Android: Netrunner World Championship will aid your organization. You'll have the chance to help your organization claim valuable assets in a special Genesys roleplaying adventure set in New Angeles. Your victory in the one-versus-many Android: Netrunner staff challenges allows you to throw the NAPD's resources against your rivals. Win the 2018 Android: Netrunner World Championship, and you'll be able to establish yourself as a major player in these turf wars—a leader of the winning organization, an elusive (and expensive) asset for the losing organizations, an NAPD agent positioned to strike at the heart of the city's orgcrime, or a brilliant civilian able to find profit in the chaos. Only one player can win the 2018 Android: Netrunner World Championship, but everyone who attends Android: Magnum Opus will find their efforts memorialized in future Android products. Your actions will determine which criminal organization rises to the top of the world's greatest and most influential city. You'll steer the future of the Android setting, and you'll see the results reflected first in a future Genesys roleplaying adventure that you'll be able to download for free. Additionally, your efforts in these Turf Wars may earn you a personal share in the Beanstalk's smuggling trade. Each attendee associated with the criminal organization that claims control of the Beanstalk will win a special, acrylic click tracker in the form of the worlds' most important architectural marvel! Android: Netrunner and its Organized Play may be coming to an end, but all true fans know there are plenty of ways to bypass or break an "End the run" subroutine. Join us this September 7th – 9th for the 2018 Android: Netrunner World Championships at Android: Magnum Opus and upload your consciousness into the Network. You'll enjoy fantastic games, superlative prizes, and one of the greatest communities in all of gaming. More than this, your actions will live forever in the Android setting, breathing new life into it and impacting the design of future products. We'll have even more information about Android: Magnum Opus in our upcoming previews. Come celebrate Android: Netrunner, its community, and its legacy. See what the future holds for the Android setting! Download the event schedule (pdf, 150 KB). All times are CDT (UTC/GTM -0500). Updated 8/31/2018: Event schedule added.